Representatives of Religions for Peace visited Sittwe and Maungdaw in the north of Rakhine State, Myanmar, where militant attacks in August 2017 triggered massive operations by the security personnel on the area’s Muslim communities and some 700,000 Muslims and hundreds of Hindus fled to Bangladesh. This region has also seen terrorist attacks by the Arakan Rohingya Salvation Army (ARSA) accused of massacring 100 Hindus and attacks on other ethnic and religious minorities. While acknowledging the authorities’ duty to maintain law and order, the delegation expressed a concern that an excessive use of force could hamper the peace and reconciliation process. The delegation saw from the air hundreds of burned and destroyed Muslim villages before visiting the sites of reception centers and transit camps. Included in the mission were meetings with representatives of various ethnic and religious groups. It was noted with appreciation that refugee return infrastructure such as reception centers and transit camps are ready to welcome returnees from Bangladesh. Technical facilities, equipment, and necessary staffing such as health screening and identification procedures are in place. This calls for speeding up the finalization of the agreement between the Myanmar government and the United Nations on the return of refugees from Bangladesh. The delegation affirmed the relevance and urgency of the recommendations from the Advisory Commission on Rakhine State led by Mr. Kofi Annan. The delegation exchanged views with Union and Rakhine State government officials, stressing the need to overcome the prevalent culture of fear and suspicion and to promote inter-communal harmony, irrespective of religion, ethnicity, gender and citizenship. This multi-religious message for peace found in all religions was shared by members of the delegation. In response to different narratives of victims, the delegation urged the Union Government to take full responsibilities for a thorough and transparent investigation into multiple crimes perpetrated in Rakhine State, including events related to entire populations such as the Rakhine Muslims, Myo, That, Dynet, Khamee, Kamen and the Hindu. Religions for Peace is encouraging a process to establish facts, restore rights of victims, and support social and political change. The process will contribute to overcoming fear, hatred and intolerance in Rakhine State and elsewhere. In the meeting with the Religions for Peace multi-religious delegation in Nay Pyi Taw on 25 May, State Counsellor Daw Aung San Suu Kyi welcomed the delegation’s offer of multi-religious solidarity and accompaniment for humanitarian response and peace building in Rakhine State, as well as in other ethnic conflict situations. 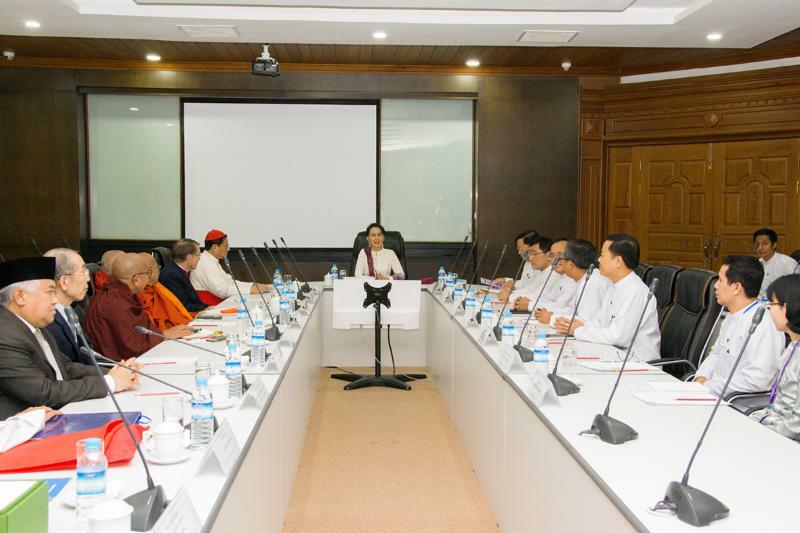 The first meeting of a Religions for Peace Advisory Forum on the Advancement of Peace in Myanmar is scheduled to take place in October 2018, bringing together representatives of the Myanmar government, the military, parliamentarians from ruling and opposition parties, UN agencies, ASEAN, ICRC, international NGOs, national NGOs, religious leaders, and experts. Accompanying the delegation were Union Minister for Religious Affairs, Chief Minister of Rakhine State, State Minister for Planning and Finance, and senior officials from the Ministry of Foreign Affairs. His Eminence Cardinal Charles Bo, on behalf of the delegation, expressed appreciation to the Union and local governments and the military for facilitating this visit.